Whew! Hopefully we all made it through the holidays in one piece. If you over-loaded on cookies (we have proof that I did, here on this website), ran around shopping like a crazy person, or traveled to and fro seeing family and friends, chances are good that you are ready to start the new year with some good, easy, no fuss recipes. This chicken dinner is just the thing. It’s a one pot wonder that roasts in the oven. With just a little chopping and basting, you get a beautiful golden bird, big pot of veggies, and delicious sauce or gravy. I’m a big fan of roasting whole chickens. 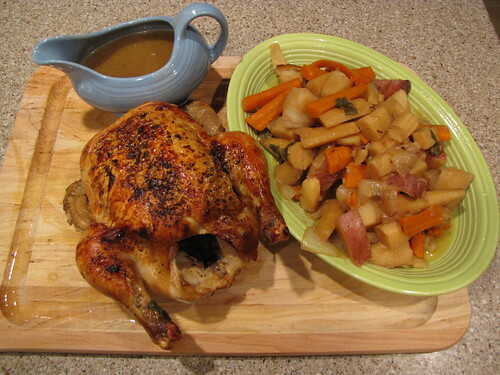 Julia Child said that you could tell if someone was a good cook not by tasting their fancy sauces and dishes from complicated recipes but rather if they could put together a simple roast chicken. 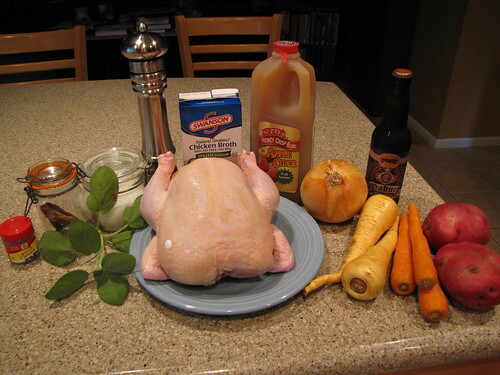 The thing that makes this chicken special is that it uses apple cider and beer rather than traditional chicken stock. Whole Roasting Chicken, Apple Cider, Chicken Broth, Beer, Onion, Parsnips, Carrots, Potatoes, Sage, Whole Cloves, Cinnamon Stick, Olive Oil (not pictured), Salt & Pepper. Also butter and flour for thickening the sauce (not pictured). Check the inside of a nice big (4 pound) roasting chicken and remove any giblets or little bags of innards. Sometimes they also put the neck of the chicken down in there too. Take any of those extras out of the chicken and save them in the for making stock. (or cook them for the cats) Rinse the chicken inside and out and pat dry with paper towels. Set the chicken aside while you prepare the vegetables. 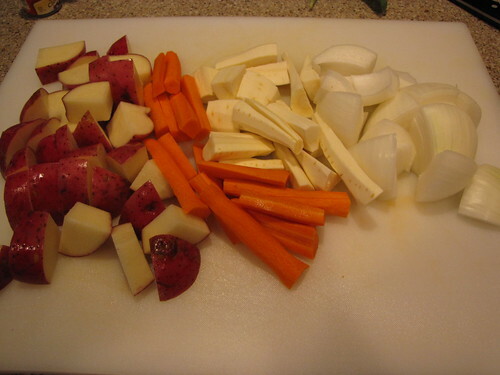 Onions, carrots, and potatoes are traditional roasting vegetables. 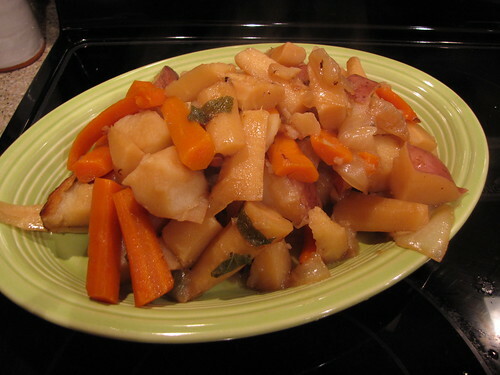 This recipe also includes parsnips which are related to carrots but lighter (almost white) in color and with a milder flavor. My only issue with parsnips is that they can be a little woody. However the cooking them with the chicken in all the good juices gives them plenty of time to soften up. Cut one large onion and 2-3 potatoes into big pieces. Peel 2-3 parsnips and carrots and cut them into large pieces. Keep the veggies on the large and chunky side so that they can hold up to the longer cooking time. 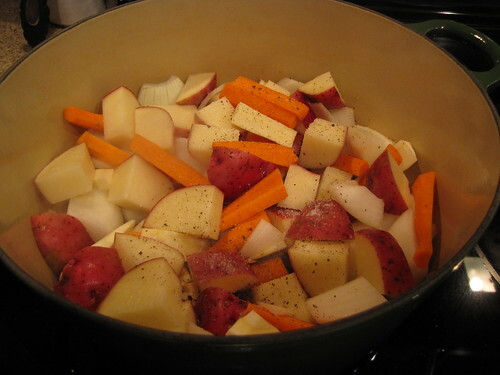 Put all of the vegetables in a large pot or dutch oven on the stove over medium high heat. Season them with salt and pepper. We’re going to get the vegetables and liquids started on the stove and then move them to the oven with the chicken. 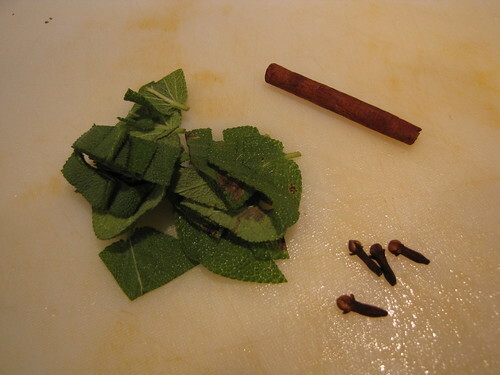 For extra flavor and a bit of something different, add 2 Tablespoons of chopped fresh sage leaves, 1 cinnamon stick, and 4 whole cloves to the pot. If you don’t have fresh sage, you can substitute 1 Tablespoon of dried or rubbed sage but be sure it is the leafy kind that looks shaggy rather than like powder. If ground powdery sage is all you can find, I’d go easy with only about 1 teaspoon. The cinnamon and cloves seem a bit unusual for chicken but give a really good, subtle woodsy flavor when combined with the cider and beer. HOWEVER, if all you have is ground cinnamon and cloves and not the whole spices, I would skip them (or just use the smallest pinch possible) as the ground spices will be much to strong and you risk your chicken tasting weirdly like pie. Add one 12 ounce bottle of nice brown beer to the pot. Pick something like Amber Ale that will have good flavor and middle of the road color…not too light, not too dark. For those of you who, like me, do not particularly like beer, I will assure you that this dish does not taste at all beery. Cooking with beer (which I love to do) is a whole different thing from drinking beer (which I don’t). 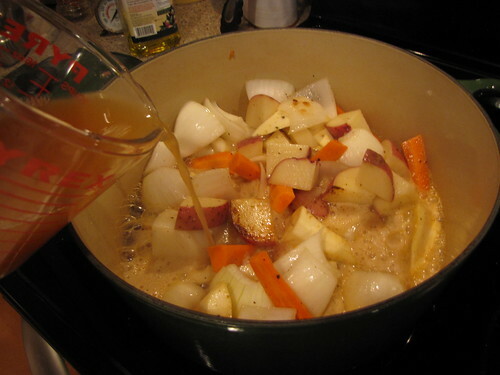 Add 1 cup of apple cider and 1 cup of chicken broth to the pot and bring the liquids up to a boil. Put the chicken on top of the vegetables and season it well with salt and pepper. Drizzle a little olive oil on the top of the chicken to help it brown nicely. Put the pot in the oven uncovered and cook at 400 degrees. 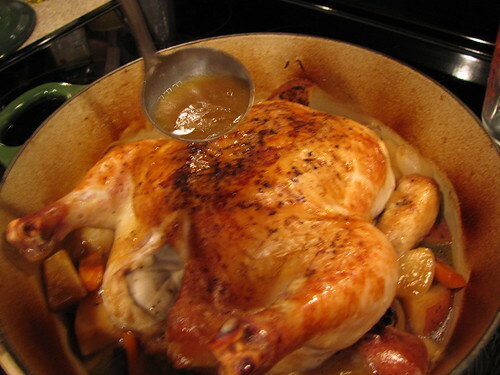 After cooking for 30 minutes, baste the chicken with the juices from the pan. Cover the pot with foil to prevent over browning and return the chicken to the oven for another 30 minutes. After the second 30 minutes, remove the foil, and baste the chicken again with the juices. I don’t have a baster so I just use a spoon or small ladle. Leave the foil OFF the pan and return the chicken to the oven for a final 20-30 minutes. The chicken should take 80-90 minutes to roast completely. You might get lucky and have a little pop up thermometer on your bird or you can use an instant read thermometer to double check. 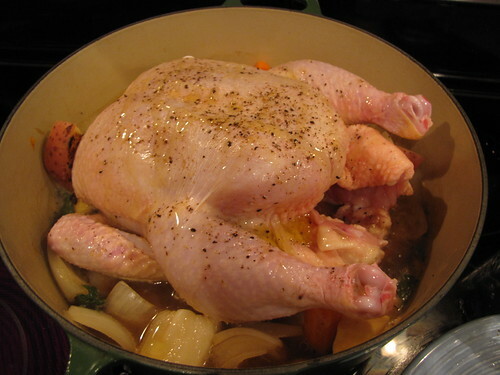 The chicken is done when thermometer inserted into dark meat like the thigh reads 160 degrees. 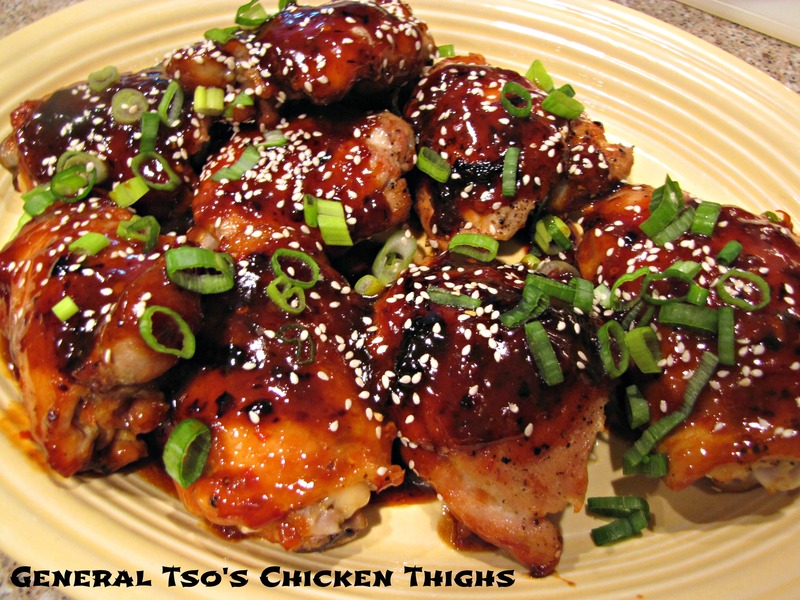 The legs should wiggle quite freely and any juices from sticking the chicken should run clear. Remove the chicken to a platter and cover loosely with foil to keep warm. Use a slotted spoon to remove the tender vegetables to a platter as well. 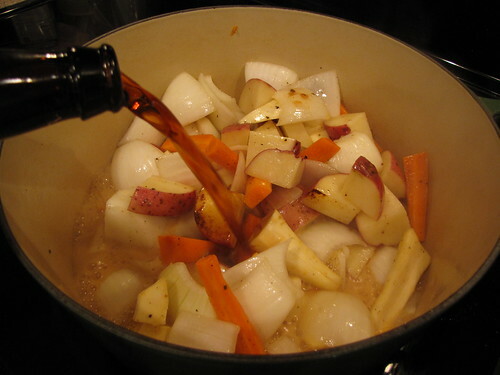 Bring the remaining pan of juices up to a boil and cook until reduced by half. I decided that I would like the juices to be just slightly thicker like gravy so I made a quick paste of 1 Tablespoon butter and 1 Tablespoon flour. 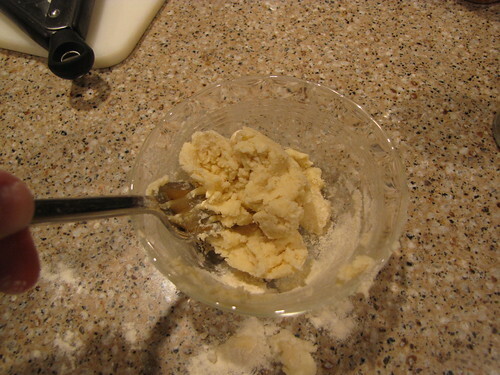 This is a French cooking trick called a Beurre Manié or “kneaded butter.” If you were to just toss some flour into the pan to thicken the gravy you would have a clumpy mess. 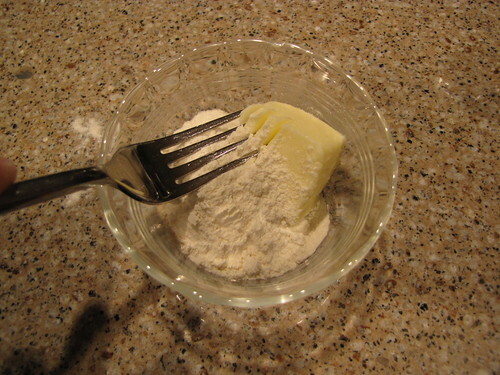 However, by quickly mashing the flour into the butter, you help mix the butter into the fat so that it dissolves when it hits the pan of liquids. Stir the Beurre Manié (butter and flour combo) into the reduced chicken juices and they should thicken up to make a nice light gravy. After the chicken has rested about 10 minutes so that the juices have had a chance to reabsorb into the meat, carve off servings dark and white meat, and serve with the roasted veggies and silky gravy. 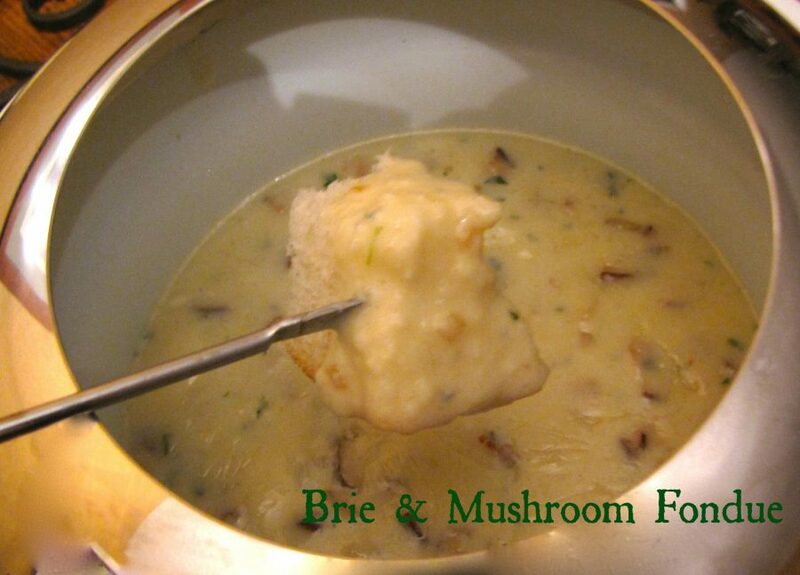 I really loved the unusual cider/beer/savory spice combination of flavors in this recipe. 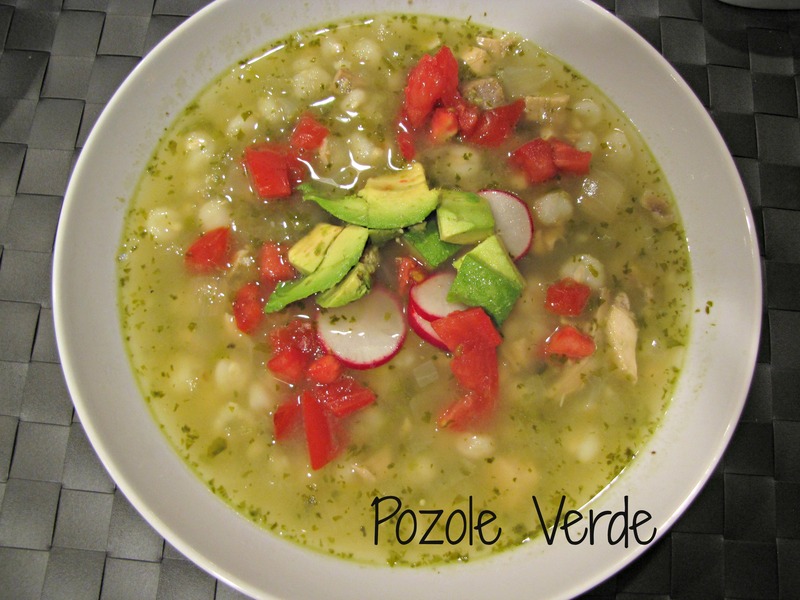 Plus you can’t beat cooking everything in one pot for easing into the new year. there is nothing better than a nicely roasted chicken. Oh yeah….this is calling my name. 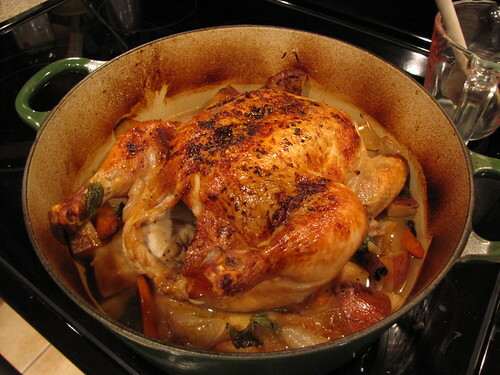 My favorite thing to cook is a whole chicken, and adding beer just makes everything better! Thank you for sharing. Happy new year my cat loving, awesome cooking friend! That chicken looks fabulous! Can’t wait to try it! It looks really truly evilly wonderful ! Just the skin …. yuuuuum ! 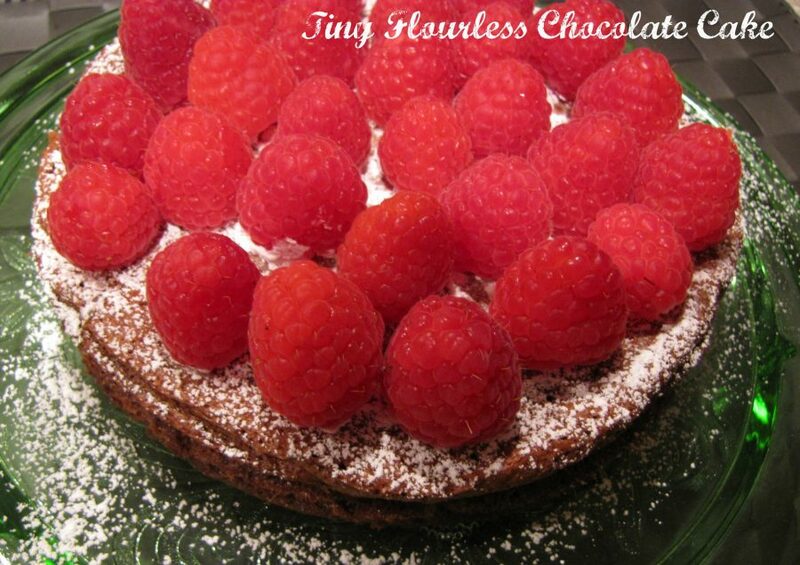 Need to go shopping for a few things, then I’m making this!